*Shipping costs included, US and Canadian tax rates excluded. Please note that persons holding a Canadian First Nations Status Card and living and working on their reserve are generally tax exempt. Sterling silver ladies' ring designed and handcrafted by Zhaawano Giizhik. 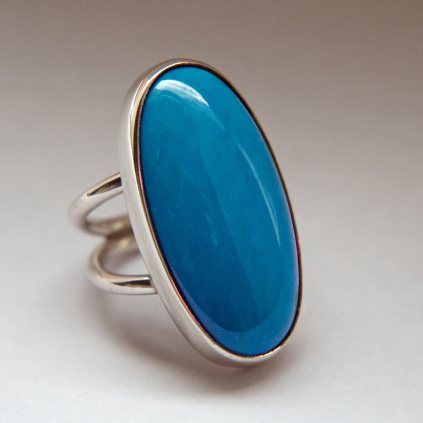 The ring has a two-prong ring shank and is mounted with a 1.97 x 1.18 inch (15 x 30 mm) high-grade blue turquoise. The moon called “month of July” in dominant society is called “middle of the summer moon” or "berry moon" by the Anishinaabe First Nations throughout Canada and the USA. During this moon the berries are ready for picking. The solid blue color of the high-grade oval turquoise stones symbolizes zhaawano-giizhig (the Southern Sky), the warm land were zhaawani-noondin (the South wind) rules. Subtle white strokes of clouds upon the blue sky stone complete the ring design. The blue color of the stone also represents the smoke of giizhik (the northern white cedar, the tree of life). Giizhik aniibiish (the cedar leaf) is a sacred, medicinal plant among the Anishinaabemowin-speaking peoples of the northwoods and a harmonizing spirit that represents the southern direction. To read more about the symbolism of this ring, please go to our art blog.